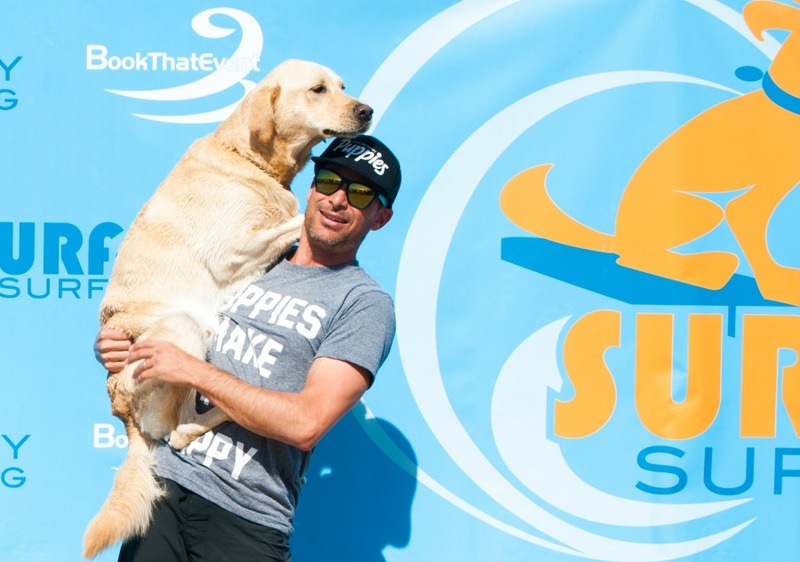 I’m always on the lookout for new, fun activities to try with my pups, and whenever I see pictures from the annual Surf City Surf Dog competition out in California, well … I find myself drooling with envy just a little bit. 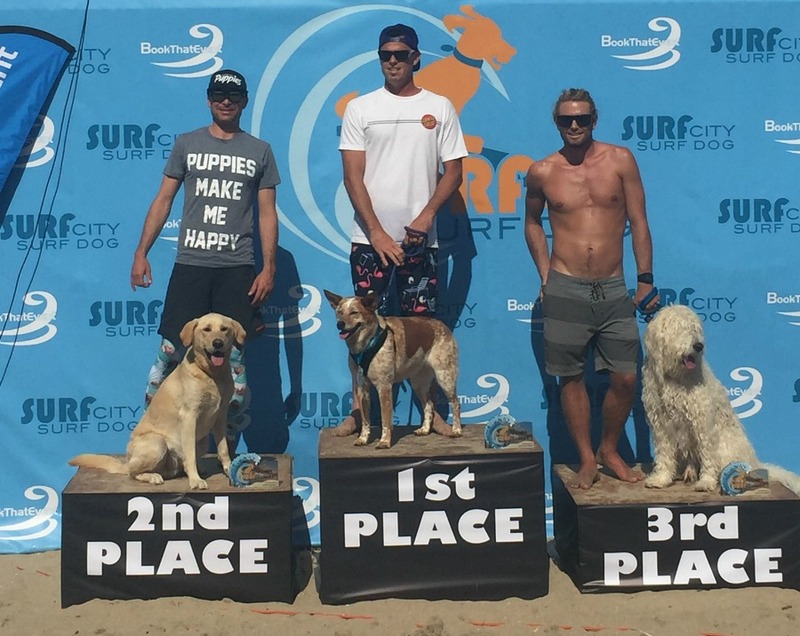 So, when the folks at Puppies Make Me Happy (yes, they sent me a couple of shirts and they have become some of my favorite shirts ever) offered to put me in touch with Brian Downes, a surfer and dog owner who recently participated (and took second place!) in the Surf Dog competition, I was on it like a wahine on some heavy waves. FBG: How did you begin surfing with your dog? BD: Bakio and I were both born and raised on the Big Island of Hawaii, and the beach is our favorite place to be. When he was a puppy we spent a ton of time at the beach, playing in tide pools and getting comfortable in the ocean. Surfing was just a natural progression in our journey of froth. Then we met the Puppies Make Me Happy dudes, and they sponsored our entry fee into the Surf City Surf Dogs contest in Huntington Beach. FBG: Are there certain characteristics that indicate a dog might be a good (or terrible) surfing buddy? BD: I met Baks at two days old. We have a super tight bond, and we have total trust in each other. Bakio will ride in my lap on a dirt bike, sit shotgun in the Polaris Razor, or hang paws off the nose of our longboard. FBG: What is the most challenging part of surfing with a dog? BD: Well, the most challenging part of surfing is having to be outlaws to surf! Dogs are not allowed on the beach on LA County beaches. So, The Guy and I have to run across the beach, hit the water, and get out to the lineup where we are free to enjoy the sun, swim and catch waves. FBG: How about the most rewarding? BD: The ocean is our church. We give thanks, we smile and enjoy ourselves. My wife and I really love when Bakio is all worn out at the end of a long beach day! FBG: How do you make sure you and your dog stay safe out there? BD: He wears a life jacket, but knowing how to read the ocean is everything. Waves are unpredictable and we do our best to avoid dangerous positions. 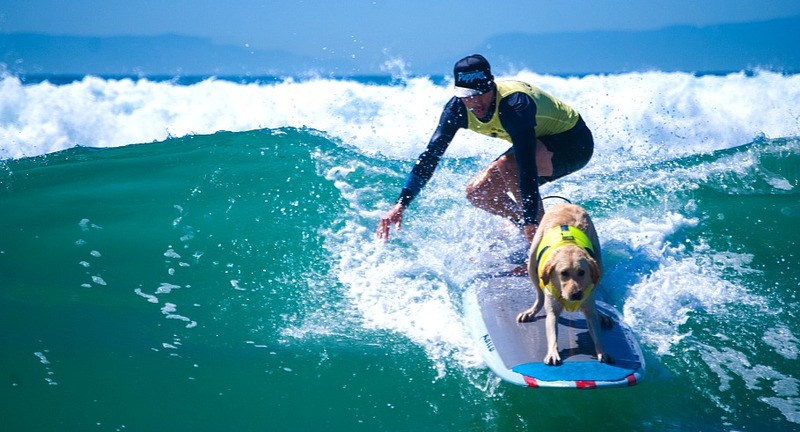 FBG: Can you offer a few tips for teaching your dog to surf? BD: Your dog has to be comfortable with the water. If your dog isn’t having fun, stick to the throwing the ball. Starting on a SUP in calm water is a great way to get started! Using a tennis ball is also a great way to get started.